LittleBigPlanet isn't just about game creation, it is, the developers hope, a whole palette of tools that can be used to create anything from a puppet theater to graphic novels to pop-up books to music sequencer. "It's a creation tool," said Kenny Young, LBP's audio designer. The misconception that LittleBigPlanet is all about game creation is likely fed by the deep toolset included in the game that supports making games. Media Molecule included those because they wanted to make sure people could, if they wanted to, make their own games. But they hope that's not all people do with the game. "Games have conditional elements," said Kareem Ettouney, Media Molecule art director. "We wanted to make sure that there is a tool set in there that allows you to create those elements. "But the exciting part of LittleBigPlanet is everything else you can do with it. We didn't want to hinder people. What we wanted to make sure we widened the palette. The only real limitation is your imagination." So when Sony Computer Entertainment of America called Media Molecule and suggested that they hold a design contest at the historic Parsons School of Design in Greenwich Village, the team jumped at the opportunity.The concept behind the LittleBigPlanet Game Jam was to drop more than 100 students in front of a Playstation 3 and the game and set them loose to create what they could in 24 hours. The students came from a variety of backgrounds including graphic design, photography and even a few hopeful game designers. The students were broken up into teams of half a dozen or so and given the weekend, noon to noon, to create what they could. On Monday the creations were judged by a group of game journalists and game designers. The final half dozen were later on display, open to play, at the Sheila C. Johnson Design Center. I asked Ettouney and Young to walk me through some of their favorites among the finalists. Among the short list was a racing game, a creation that had sack boys and girls hopping through a washing machine collecting points while avoiding the deadly spin cycle, and a masterpiece of design that has gamers working their way through an ambling creature from bellybutton to tongue. Team Bloody Clown's rocket-powered racer won for most fun creation in the contest. In the game you and up to three other Sackfolk grab onto a car and then fire up it's rocket, using the sheer force of the engine to shoot around a track that runs along all four sides of the map. If the sack holding onto the steering wheel drops off the engine stops and everyone falls down. The key to surviving the trip, I'm told, is a careful distribution of weight. Team Pretty Pretty Princesses washing machine creation won for most personal creation in the contest. Their design, which features a giant washing machine packed with customized clothing (yes even a bra), was one of the more visually intriguing designs among the finalists. The virtual washing machine was also created by a team made up almost entirely of female graphic and visual designers with no gaming experience or interest. "I'm not necessarily a big console gamer," said Rabia Malik, "but (LittleBigPlanet) was very engaging." The most intriguing of the lot was definitely Team Good Sportsmanship's Sack Monster. The 24-hour creation told a story, albeit a short one, and included some very interesting design choices. In Sack Monster the entire game is the Sack Monster. Sackboy has to take on the giant creature that, according to a fish out of water, is gobbling up sackboys. "We really wanted to push the limits of LittleBigPlanet," said Kunal Patel, who plans to eventually hit Media Molecule for a job. To enter the game-filling creature, Sackboy has to hope from dangling hooks, climb up the creature's chest and make his way into Sack Monster's bellybutton. Once inside, Sackboy must make his way through the creature's stomach, heart, intestines, across the wings, through the brain and finally out the thing's jagged-tooth filled mouth to the finish line resting on top of its head. Think of it as a platforming take on Shadow of the Colossus. The level is packed with tons of creativity in both game mechanic and visual design. As you prepare to make your way inside the beast, for instance, you have to climb across two bloody arrows embedded in the creature's stomach. Later in the game, as you strive to avoid the sackboy-incinerating gastric juices of the stomach, gamers have to drop a tire into the pool of acid to move ahead. The tire disappears in the stomach fluids causing gas bubbles to appear and slowly drift up and out of the stomach. Sackboy can grab these bubbles and make his way to the rib cage. While the game's innovative design highlights the seeming ease with which gamers without training can create their own games, it also inadvertently reminds us that games aren't all about grandiose and artful design. Sack Monster, despite it's clever ideas, is a back-breaking level that is at times so tricky to navigate it can be almost playable. 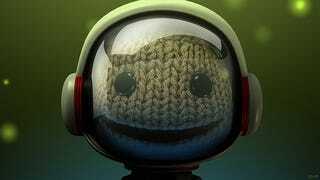 The team promises to fix that, but it's likely that such issues could become a reoccurring theme in LittleBigPlanet's user-driven content, at least initially. For their part, Team Good Sportsmanship is happy to become a future part of the official LittleBigPlanet release and have $1,000 in prize money to split among its five members. Ettouney said he was blown away by the creation. "They use the tools to create an organic creature," he said. "At the end of the day people have so much to say, to do, to express."